Amy Weist is a certified and Colo. State license massage therapist who has been practicing massage therapy for over 7 years. 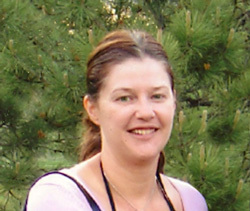 She completed her massage training at Heritage Massage School in Colorado, where she graduated at the top of her class. Now she runs her own clinic in Denver called “A Well Balanced Massage”. Amy’s training and experience allows her to serve others living with chronic and acute conditions, general stress related issues, and specific muscular imbalances. She approaches each massage to meet the specific needs of the day for each special guest. Her favorite treatment to indulge her guests in is a deep tissue massage mixed with hot stones. Clients appreciate her firm, strong touch, her intuition, and her specific knowledge of anatomy. Outside of massage therapy, Amy has a passion for the outdoors, yoga and volleyball. She loves living in Colorado and fully appreciates all the beauty that the state has to offer.